I've just finished catching up with all the comments to make me smile on my Mont Blue glass nail file giveaway post. It's been really fun reading all your little stories and you all definitely made me smile. I have a little story of something that made me smile recently, and actually makes me have a little giggle every time I see it. A week or so ago, my sweet hubby had just finishing cleaning the toilet (I know, he's a keeper right). 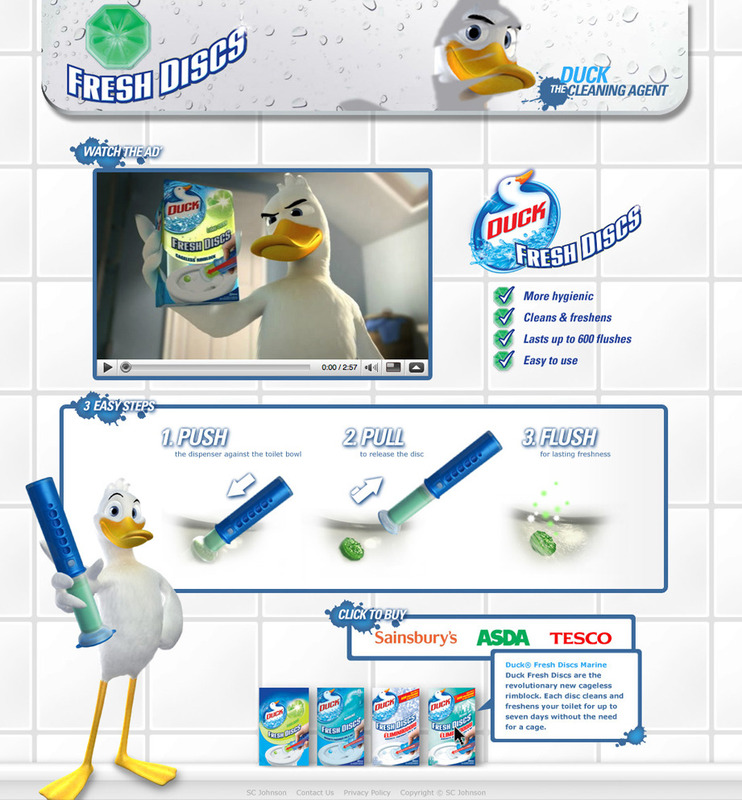 When he was finished he grabbed the Duck Fresh Disks cleaning jelly (this sort of thing). The thing is a tube of toilet cleaning jelly, that you push the insert at the end and it squeezes out a little jelly disk which sticks to the bowl. He had never applied one to the toilet before, and as he was (apparently) very carefully pressing the insert at then end, all of a sudden, it squirted out and he managed to squeeze the entire contents of the tube out in one push. Clearly he didn't know his own strength! So now, instead of a small 20 cent (quarter sized) disk of gel, he had a large dinner plate size of gel covering half the the toilet bowl. It's still there and makes me laugh every time I go to that loo! Ok, now to today's nail stuff. 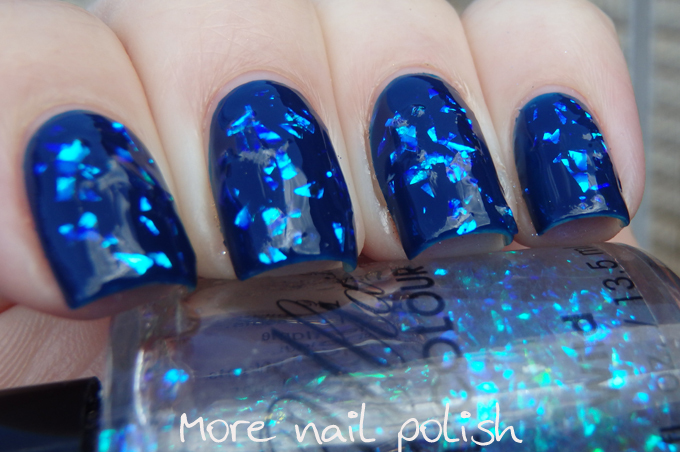 I'm actually running pretty low on swatches or nail art pictures for my blog at the moment. I think I have about a weeks worth of photos on my camera to download and edit, but I'll be stuffed if I can be bothered doing that on a Friday night! 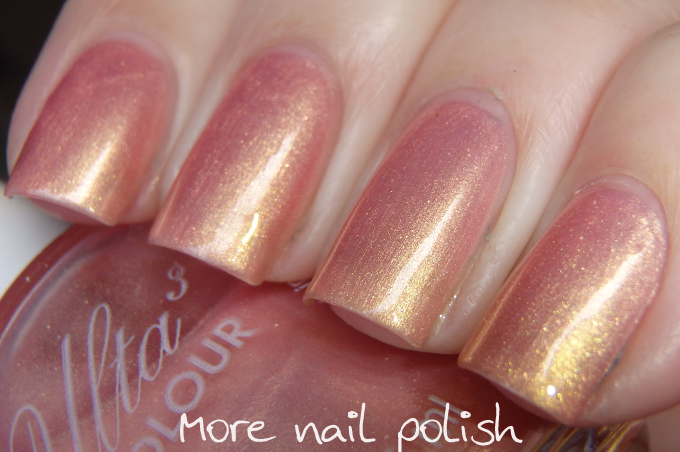 As such, you will just have to do with these swatches of a whole bunch of old school Ulta3 polishes that I've been meaning to swatch and add to my colour guide for quite literately years! You wont find any of these beauties anywhere, they are all at least 15-20 years of some of these. I'd love to know if anyone else out there had some really old Ulta3 polishes. Antique copper - no surprises why I purchased this one way back when. It's totally a me colour. 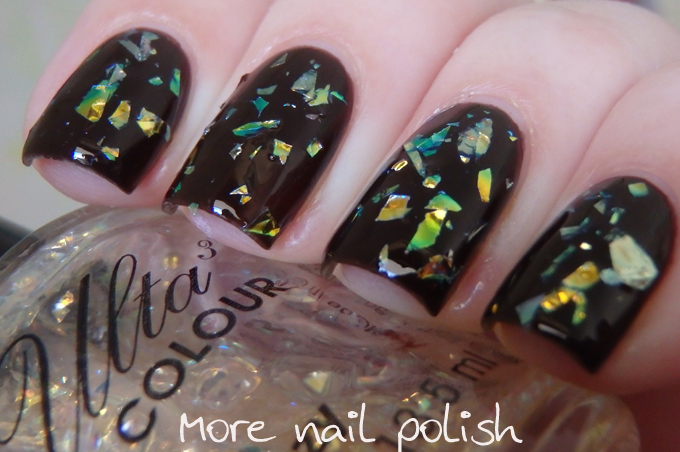 It has a mix of gold and copper micro sized glitters in a clear base. It almost builds to opacity but is probably better as a glitter topper. this is three coats. Charmed - Ulta3 released another polish called Charmed, which was a green glitter. But this one is older than that. I'm sure it was the gold shimmer in this one that caught my eye all those years ago. It's rather stunning actually. 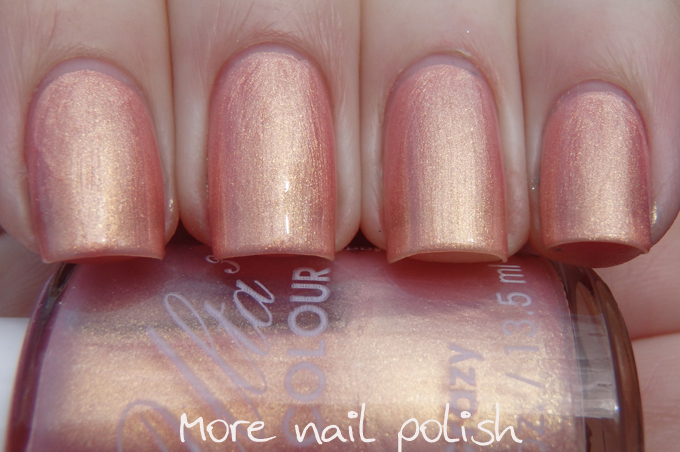 Copper Glow - Yep another gold toned polish. Most of my polish stash was made up of gold toned polishes back in the early 2000's it's what I've always loved. 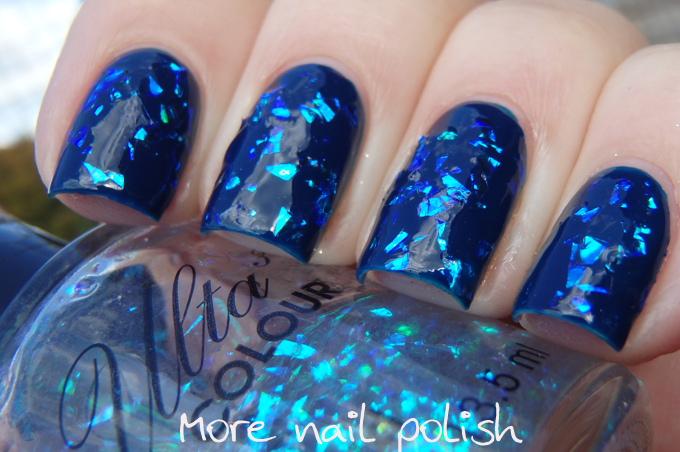 This one is a stunner, and it's a duochrome too. Pretty amazing considering it's age. This is two coats. 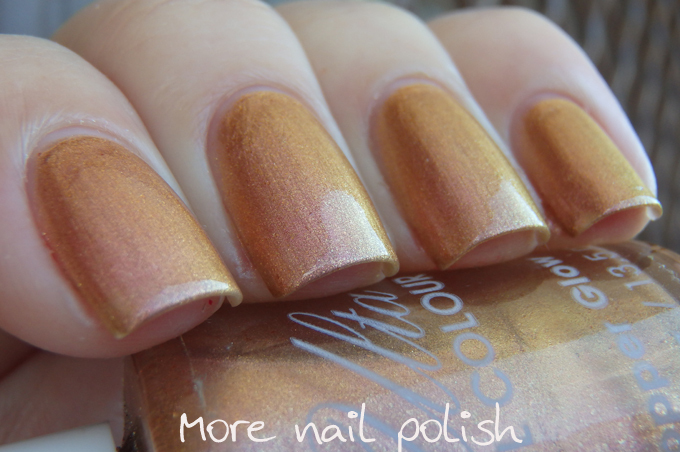 Crazy - what's this, another golden shimmer polish - yep I told you this is all I used to buy. 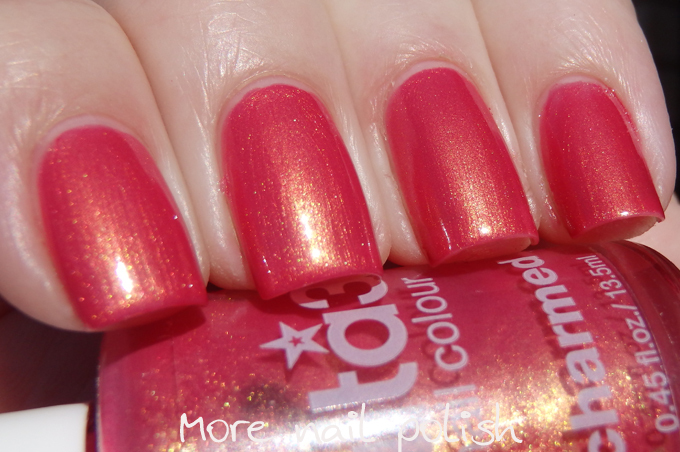 This one has a bit of duochrome to it as well, or at least a contrasting shimmer to base colour. This is two coast. Crazy - I think this is the third polish that Ulta3 has called Crazy. 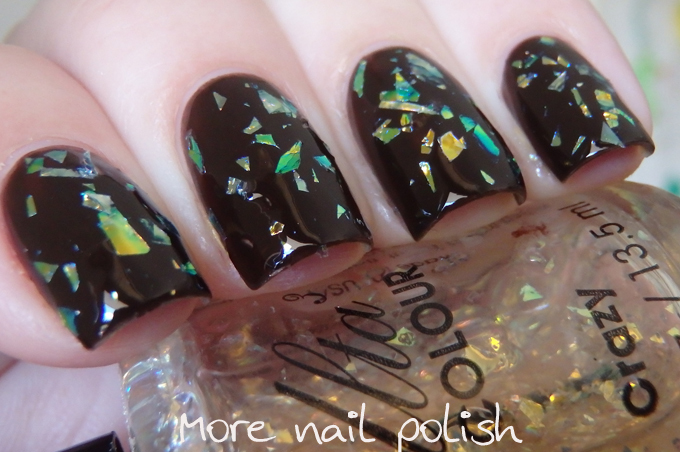 This one is a really thick base with rather chunky iridescent flakies. It's pretty cool, but the flakie bits stick up a bit. It's the same sort of finish as Color Club Covered in Diamonds. This is one coat over a dark brown. Romance - At least I can say this one is orange rather than gold and it has a heavy silver shimmer which makes it have that wet sparkle look. It's bordering on a 'grandma shade' to me, but surprisingly it looked really good on! This is two coats. Wild - just like the Crazy flakie, this one is the blue version. 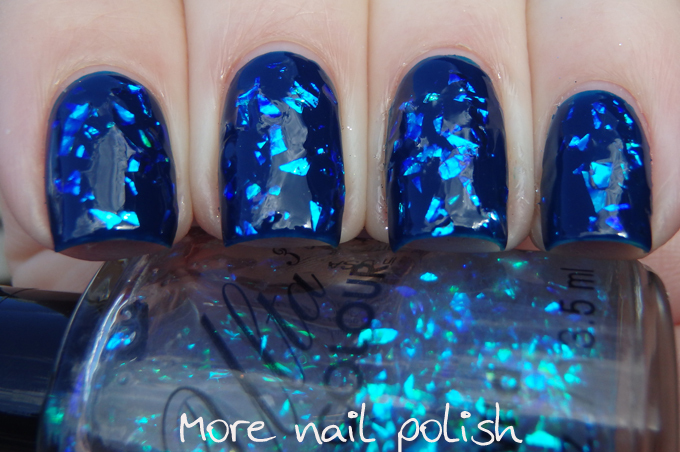 Very thick base with chunky blue iridescent flakies. This is one coat over navy blue. 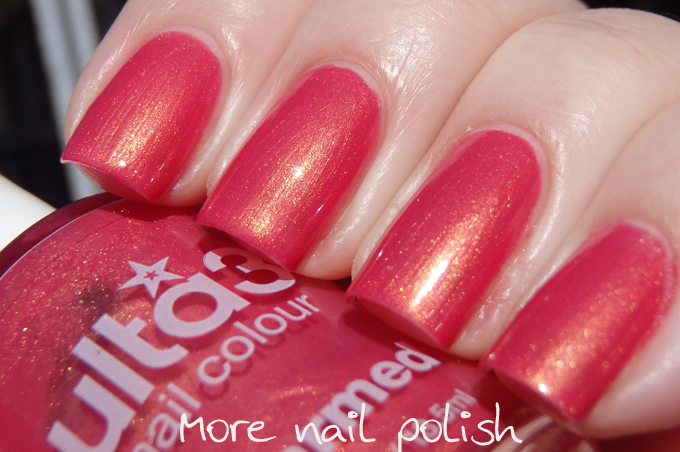 So great that you have kept all these older Ulta3s alive :-) I still have a really old Ulta3 beauty called Confetti which is a stunning pinkish red jelly with micro fine rainbow glitter - not like the more recent Confetti that is purple based. Like Wild, my Confetti bottle has the Ulta3 logo in black. 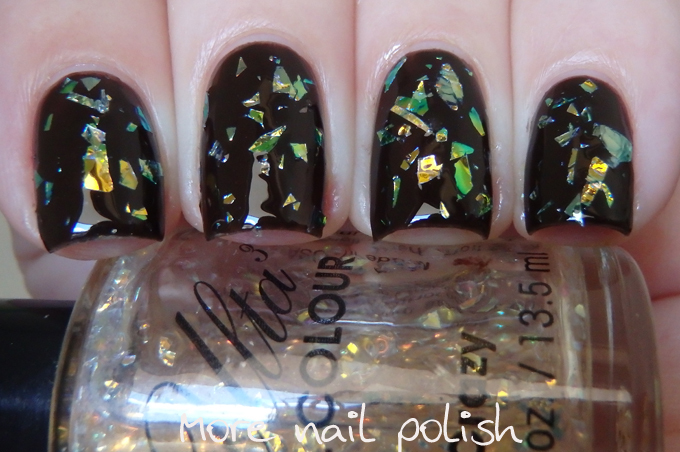 Awesome - I'd love to see some swatches of your old Confetti!! Hi. I have 31 old Ulta3s. All with the old cursive logo and all made in the USA except for Crystallina which was made in the UK. They are all over 20 years old as I bought them before I started my current job and I’ve been there for 20 years. Some of the names are still in use now but the colours are different. The colours are: Crystallina (purple with green sheen), Yummy Mauve (silver), Butterscotch (yellow), Buff (a sort of pale pinky brown), Razzle (blue but different from the current version), Freesia (purple with silver sheen), Citric Acid (pale blue), Charmed (dark pink with gold sheen, darker than your Charmed), Primrose (gold), Silvery Salmon (salmon pink), Cool Mint (pale green with holo micro glitter), Snazzle (pearl white), Pink Colada (salmon pink with orangey micro glitter), Antique Copper (same as yours), Candid Violet (pink with a purple sheen), Purple Passion (purple with a gold sheen), Waterlily (purple with silver micro glitter), Allure (dark purple), Pink Supreme (mid pink), Lagoon (light blue with silver sheen), Stardust (silver with lilac sheen and silver micro glitter), Jazzle (pink with silver sheen), Bouquet (dark magenta), Purple Passion (pale purple similar to current version), Envy (blue and silver micro glitter), Lollypop Lilac (pale pink micro glitter), Mixed Berries (magenta micro glitter), Blue Glitter, Silver Glitter, Red Glitter (all 3 are micro glitter), Boom (holo bar glitter in sheer pink base). Amazingly after all this time most of them are as fluid as the day they were purchased. OMG that is amazing, how exciting. I'd love to see swatches of these on your nails! I'm so impressed that you have so many. 20 years ago, holy crap - I knew I had them a while but had no idea it was that long! Please let me know if you ever post some swatches of them. It was only after I pulled all my Ulta3s out that I realised all but 9 of the names are still being used. 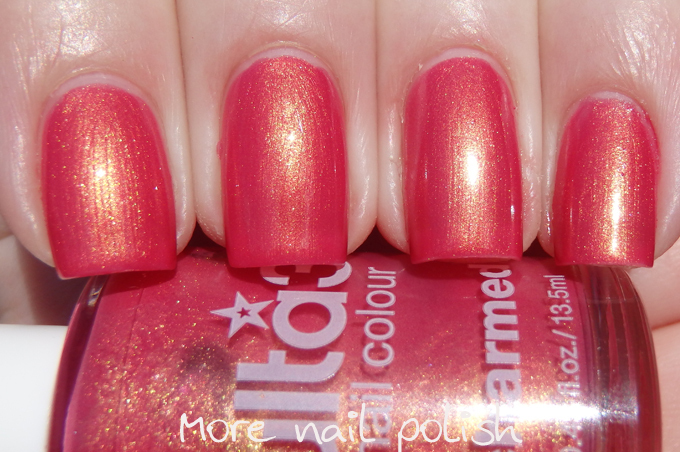 I don't have a blog or anywhere to post swatches but I can certainly email you some pics. My sister has 1 old red that I'm going to try to get a hold of as well.